Use Flat Responsive theme to create your business website as it is SEO optimized. Enjoy the flexibility in design and functionality provided by this theme. XCPT is an implant treatment planning program created by a Florida periodontist. The dental practitioner can import a patient`s radiographs (panoramic, peri-apicals) and then using the implant templates and other tools visually plan a patient`s treatment. MIS Implant Technologies Ltd.`s Abrahmi Drill Guide Kit is a drill guide kit that allows for optimal inter-implant spacing, angulation and parallelism. The kit contains several spacers which the surgeon can select to determine the inter-implant distance. The device features several drill sleeves of different diameters which ensure parallelism of the implants. 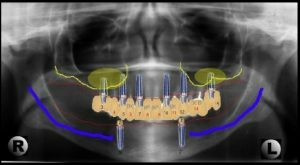 Conebeam.com a comprehensive website devoted to the art and science of conebeam ct scanners has an excellent review of all the different implant planning and surgical guide products. An astonishing 10 different systems are available. 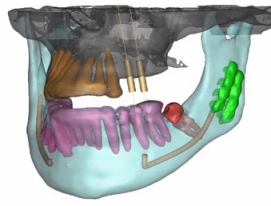 Most of the usual vendors: Materialise, Nobel Biocare Teeth in an hour, Denx and ILS are listed, but also some new and innovative systems from smaller vendors. 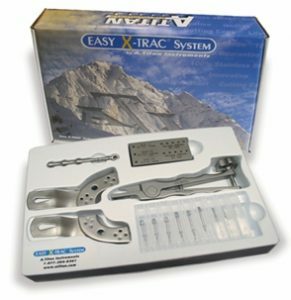 MIS`s Yeung Bone Harvest kit consists of a set of four drills with a slot that allows for the accumulation of autogenous bone during osteotomy preparation. The drill size ranges are: 2.80mm, 3.20mm, 3.80mm and 4.50mm. Materialise`s SAFE System combines drilling guidance, implant insertion guidance and depth control. Simplant is used to plan the optimal position of the implants and then this plan is transferred to the SAFE system which produces a physical guide and a surgical report to guide the surgeon during implant placement. 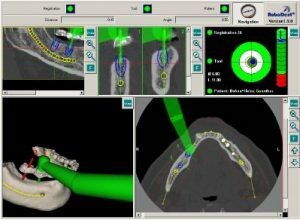 RoboDent`s navigation and implant placement planning software works with its Lapdoc system to give realtime visual feedback on the angle, depth and direction of implant placement. 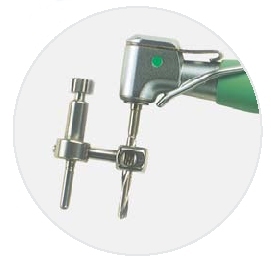 It uses 5mm titanium microspheres attached to the handpiece to track the position of the drill tip in realtime allowing the implantologist to see the depth and angle of implant placement. A. Titan has introduced an innovative system for atraumatic extractions. This system uses a pin placed in the tooth to be extracted`s root canal and then uses a rachet to pull the tooth out of the alveolus, thereby avoiding the rotational forces usually placed on the alveolus by conventional extraction methods. 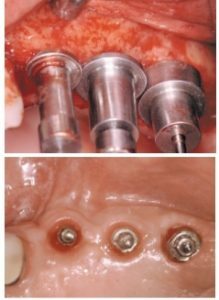 By removing the tooth in an atraumatic fashion, immediate implant placement is more feasible. Osseo Scientific has introduced an innovative autogenous bone chip collector. It features a collection cup with a bur inside the bone collection cup. As bur penetrates the bone the harvested bone chips are stored in the cup ready for immediate use. 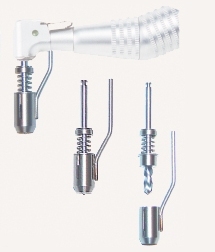 The whole assembly is autoclavable and fits a standard implant handpiece. Stoma has introduced an innovative kit to allow for optimal implant positioning and spacing. The system consists of two sets of seating sleeves with increasing diameters, 5 fixation pins and 3 straight and angled bone spreading instruments. The seating sleeves are used to plan the optimal implant diameter for a particular surgical site. They are also useful for determing the proper interproximal spacing in areas where multiple adjacent implants are planned. OTA`s new balloon sinus lifter allows for less traumatic hydraulic sinus lifts (internal and lateral approach) by reducing the risk of membrane tears. The micro-mini balloon inflates to 1.9mm with saline administered via a 5cc syringe. 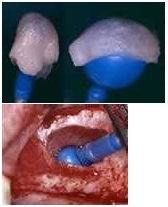 The gentle pressure on the membrane expands the sinus graft space gently without any sharp instruments.